Somebody at Arlington National Cemetery is giving awards to a Movie Star who doesn’t deserve it. Below is the interaction with workers at Arlington National Cemetery, it seems it is time for a refresher course in basic customer service. Delivery to the following recipient has been delayed: FOIA@rmda.belvoir.army.milAn email was made on the same day May 23, 2013 to let Arlington National Cemetery that the FOIA@rmda.belvoir.army.mil was not functioning. An automated email arrived a few minutes later and stated; we appreciate your feedback correspondence, which prompted this automatic e-mail response. Someone will be contacting you shortly with a tracking number. When a second email came stating Delivery to the following recipient has been delayed: FOIA@rmda.belvoir.army.mil a call was placed to the 1-877 number to let them know that their email was not working correctly. The operator who answered stated she could place the FOIA request over the phone. This request was on May 24, 2013 and that proved futile as well. On June 4, 2013 (10 days later) a call was made to check the status of the FOIA request. The request was passed up to Steven A. Dawson Records Officer Department of the Army National Military Cemeteries (ANMC). When speaking with Mr. Dawson a FOIA request had not be entered into the database. Dawson said that Mr. Jose L. Burgos Program Manager, Freedom of Information Act Special Programs Office was the person who could expedite the request for a FOIA via email. The request to Mr. Burgos was sent via email at jose.l.burgosperez.civ@mail.mil to request a FOIA (Freedom of Information Act). Burgos on June 11, 2013 sent an email that confirmed the FOIA request had been received. Burgos said that the request had been sent ahead to Arlington National Cemetery for the documents requested concerning Durning's Headstone inscription. Burgos had forwarded the request to Records Officer Department of the Army National Military Cemeteries (ANMC). Dawson on June 11, 2013 also responded and said that they were formulating a response. On June 25, 2103 an email was sent to Dawson at Arlington National Cemetery checking on the status of the FOIA request. Then received an email back from Dawson stating “I will forward all responsive documentation (today) to our CAL Office (FOIA) and they will in turn contact you." Dawson was called and a request to speak with the Branch who ordered the Headstone inscription for Durning. A short time later an email from Dawson stated “Have the operator transfer you to Ms. Renea Yates (Chief, Interment Services Branch). She will be more than happy to discuss your inquiry." Durning’s Headstone inscription Yates was extremely short in speaking saying that she had discovered an error concerning Durning's Headstone and was in the process on cutting a new one. It was interesting that Yates had discovered the error when the FOIA request had brought that error to her attention. When another error was brought to Yates concerning Durning's Headstone inscription she did not want to hear about it. She said that she had already ordered the corrected Headstone and that it was too late to correct any other mistakes. Yates then stated that there were no other errors as St. Louis NARA had checked a box that Durning was entitled to the Bronze Star Medal and the Silver Star Medal. When explaining that Mr. Durning was in fact not entitled to the Bronze Star Medal and before I could finish the sentence Yates said “I can't just expect the word of the general public”. When finally able to finish the sentence it was explained that there was over thirty documents concerning Durning's Military Record in WWII. Durning was wounded shortly after coming ashore June 15, 1944. It was explained to Ms. Yates that after the war men whose ARM of Service was Infantry (INF) and had received the Combat Infantry Badge (CIB) were entitled to the Bronze Star Medal. Private First Class Durning's ARM in the one campaign he was in and wounded was Antiaircraft Artillery Automatic (AAA) not INF while in Normandy. Private First Class Durning was not entitled to the Bronze Star Medal on his Headstone inscription because he didn’t receive the CIB. Yates then basically yelled saying if St. Louis checks a box it must be true. The next day June 26, 2013 Burgos forwarded ahead the FOIA request that had Durning's 53-55 Form (Discharge Form) and that St. Louis Archives Technician Paul Simon stated that Durning was entitled to the Bronze Star because he had received the Combat Infantry Badge (CIB). A few things about St. Louis, the first being that Simon was wrong as the Discharge didn't mention the Combat Infantry Badge because he was not entitled. The second problem with St. Louis is Simon had to put in all caps his name PAUL SIMON. Do you really feel it necessary to have your name above even the awards i.e. Medal of Honor which is not all in upper case, yet Simon’s is. The third mistake by St. Louis is on their Check List it has Bronze Star Medal which is correct, yet they have just Silver Star when it should be Silver Star Medal. Just stating that someone has received a Medal or Award does not make it real or correct. St. Louis and Arlington National Cemetery are just rubber stamping this information. 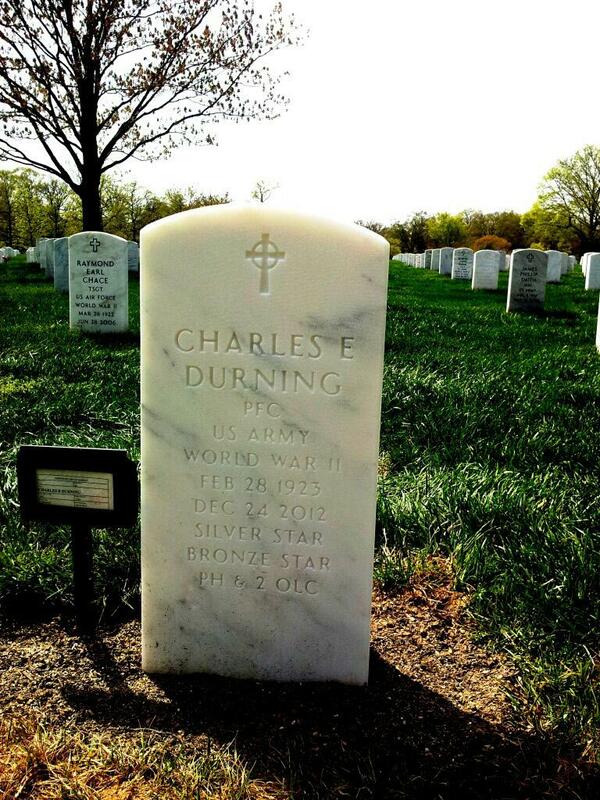 Now we come to the Durning's Silver Star on his Headstone inscription. The other lines about the Bronze Star Medal and 2 extra Purple Hears have been discounted by Army Paperwork. The problem with the Silver Star Medal is three fold. The first being it should state Silver Star Medal and on Durning's discharge, it just has Silver Star. There are other examples on a Silver Star Medal being listed as Silver Star but once again there should also be a General Order for the Silver Star Medal even if it just list Silver Star. Durning has no mention of the General Order and he was only in one Campaign (Normandy). There is a Silver Battle Star though. The Bronze Battle Star was given for every campaign a soldier participated. When 5 Bronze Battle Stars are awarded it turns into a Silver Battle Star. Since Durning was only in one campaign he was entitled to one Bronze Battle Star. It is most likely that should have had the Bronze Battle Star on his discharge and a typographical was made. In this case Arlington National Cemetery needs to prove that Durning in fact did receive the Silver Star Medal. There is no General Order for Durning showing that he was awarded the Silver Star Medal. There has to be a General Order as well, otherwise we might as well give everyone any award they want on there Headstone inscription. Durning was severely wounded coming in as a replacement in Normandy. Durning is not allowed to have any other Medals on his Headstone inscription besides Purple Heart which is more that enough. My Uncle Corporal Elmer Q. Siddall was a member of the 82nd Airborne Division and was killed on the jump into Normandy on June 6, 1944. Yet he is only allowed one Medal the Purple Heart because his Arm of Service was Engineer not Infantry with the 307th Airborne Engineer Battalion. The Engineer's were not entitled to the Combat Infantry Badge either. In doing the research about Mr. Durning I realized that Durning had stated he had come ashore on June 6, 1944 but the records show him coming ashore the June 15, 1944. This means that Mr. Durning was not entitled to the Bronze Service Arrowhead. The Bronze Service Arrowhead for Normandy was awarded for coming ashore June 6th or 7th 1944. What that does mean though is that my Uncle should have been given the Bronze Service Arrowhead Posthumously. The next step will be to contact the Army concerning the Bronze Service Arrowhead for all of the Soldier's killed in Sicily, Normandy and Holland. If any family members have questions about Award don't rely on St. Louis NARA as it incorrect on a lot of their work. 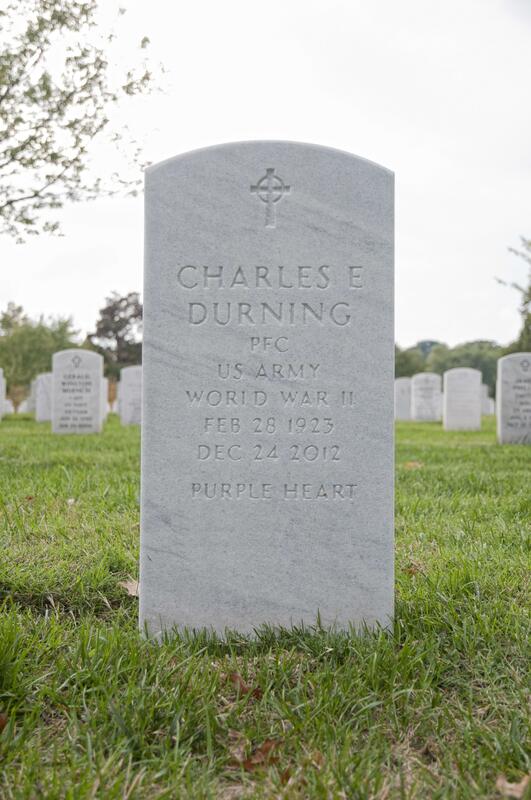 In the future if documentation can be provided, Mr. Durning's Headstone inscription can be added below the Purple Heart Medal. Until that time Mr. Durning is allowed to have the Purple Heart Medal on his Headstone and nothing else. Yates seemed to feel that this was a vendetta against Durning, but this is not true. In fact Durning never applied for the Bronze Star Medal or two extra Purple Hearts, just one. Even on the Silver Star he never requested that the Silver Star Medal appear on his Headstone inscription. If Arlington National Cemetery is just relying on St. Louis NARA for the Headstones inscription that is very poor work. Arlington National Cemetery should double check all Headstone inscriptions before putting it to Marble. You can't rely on St. Louis because in the case of Durning they were just relying on the 53-55 Discharge when they should have also found the General Order for the Silver Star Medal. St. Louis NARA should have done due diligence concerning the fact that Durning did not receive the Combat Infantry Badge Award either. NARA at St. Louis is ineffective in the work that they do. St. Louis NARA refuses to respond to the error they made concerning the Durning Headstone debacle. It seems that at Arlington and NARA at St. Louis someone from Durning’s entourage got to someone and was able to have a Headstone put up that is pure fantasy, just like a Hollywood movie. Below are the two headstones for Durning and neither is right. The third one is what it should be but isn’t. That Arlington Cemetery itself is allowing fake inscriptions on a Headstone which brings into question everyone buried at Arlington and that should not be allowed to happen. That is an insult to all the men and women and their families who are buried there. This calls into question all Headstone inscriptions if someone like Durning is allowed to have awards he was not entitled to. Remember, Durning talks on video of him coming ashore on Omaha Beach on 6 June 1944. No he came ashore 15 June 1944 and was wounded when stepping on a landmine. By 15 June the Engineers had marked the paths to walk on and apparently he left a marked path and stepped on a mine, most likely a Bouncing Betty by the type of his wounds. If you are wounded from the waist down it is most likely a mine. Arlington is even now blocking the correction of his marker. They say they have to check with the Army again even though the Army signed off on these 8 months ago now. Obviously someone doesn’t want the record corrected. Should the Defense Department Inspector General investigate this as Arlington itself is trying to block this correction? I also think anyone who lies about their service should not be allowed to be buried in a National Cemeteries. And if it can be proved anyone buried in a National Cemetery should have to be disinterred and moved to a non-National Cemetery. Below are the two headstones for Durning and neither is right. The third one is what it should be but isn’t. That Arlington Cemetery itself is allowing fake inscriptions on a Headstone brings into question everyone buried at Arlington and that should not be allowed to happen.